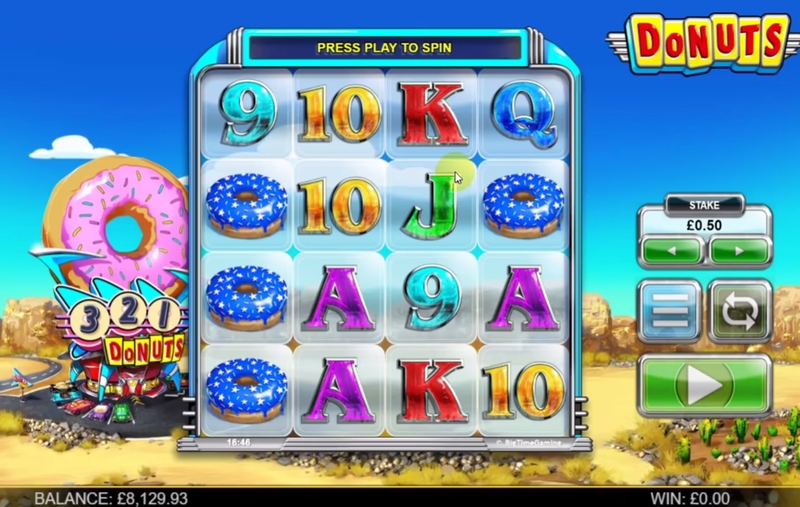 Donuts slot is a Big Time Gaming title set in a Donut bar in the middle of the desert, which also turns into a rocket! Sweet sugary treats are not uncommon in slots as we have seen in Playtech’s Sweet Party and Microgaming’s Candy Dreams, however this game comes with all sorts of blood sugar-raising features that make it just as a addictive as those boxed up donuts. So what have Big Time Gaming packed into this treat of a game to get our mouths salivating? The slot is on a not-so-typical 4 reel by 4 row grid and a huge 2105 ways to win. This is only possible due to the ‘donut boxes’ which offer up to 4 donuts or multiplier Wilds. With potentially more than one landing on each reel this certainly pushes the winning potential up. Top paying symbol is the purple donut, paying 15x for 4-of-a-kind (4OAK), dropping dramatically to 2x for a 4OAK of red donuts and 1x for a 4OAK of Blue and Green donuts. Lesser paying symbols are the A-K-Q-J-10, making up the remaining symbols. The only one symbol I haven’t mentioned is the Gold Donut scatter, which I will come onto shortly. 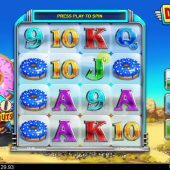 If you land 3 or 4 golden donut scatters on the reels you will trigger the Donuts Bonus feature – rewarding you with 12 or 20 free spins respectively. To determine your multiplier you will first take on the Bonus Countdown which takes place on a new set of reels before the feature. The reels will spin and if Golden donuts land they will reveal a multiplier of between 1x - 50x! Your multiplier for the feature is the total added up at the end of the Bonus Countdown. The free spins will then begin with your original free spins total and the newly set multiplier from the Bonus Countdown. If you land 2, 3 or 4 scatters in a single spin during the feature then you will gain a corresponding 10, 20 or 30 spins. Look out for the ‘slow spins’ in the feature, reminiscent of White Rabbit and Dragon Born, which will signify a win is about to come in - the anticipation makes it all the more exciting.